George Clooney with Director Jason Reitman on the set of "Up in the Air." London, England (CNN) -- Director Jason Reitman's new film "Up in the Air" is a decidedly grown-up affair. Just three years after the Oscar-winning indie flick "Juno" won audiences over with its heartfelt portrayal of a high school heroine, Reitman is back with a sobering, almost existential story about adult life, job loss and the one thing he believes matters most -- human connections. The 32-year-old filmmaker, also known for his snarky 2006 satire about Big Tobacco, "Thank You For Smoking," says the newfound emotional depth of his latest movie is a product of his own personal growth. "Over the six years that it took me to write it, my life really evolved," Reitman told CNN about the "Up in the Air" screenplay. "I went from [being] a single guy living in an apartment to a married guy with a daughter, professional director living in a house with a mortgage, and my perspective just changed. "I don't know what's important in life," Reitman said, reconsidering. "I'm just begging the question, 'Actually, what is?'" "Up in the Air" captures the life of a lonely corporate exec whose job is to fly around the world firing people. Lacking a single meaningful, personal relationship, he struggles to find fulfillment when his all-consuming job slows down. "I like humanizing really tricky, normally unlikable characters," he said, describing his approach to movie-making. Ryan Bingham, his latest protagonist, played by George Clooney, certainly fits the bill. To help audiences empathize with him, Reitman focuses on what's missing in Bingham's life instead of what's in it. "I wanted to make a film where you didn't realize how valuable companionship was by watching two people in love," he explained. "I wanted to make a movie where you'd realize the value of companionship through loss." Reitman says he wanted to shed light on that moment when a person realizes for the first time, "Holy s***, I don't have something that I really want and that I need." 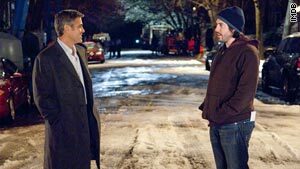 The thought-provoking storyline resonated immediately Clooney, who Reitman wrote the role for. Reitman remembers how relieved he was when the A-lister readily agreed to take the starring role. "To be honest, when he read the script, his response was 'I just read it, it's great, I'm in.' That was the conversation," Reitman said. Reitman adapted the script from Walter Kirn's 2001 novel along with writing partner Sheldon Turner. "Up in the Air" "cleverly taps into specific cultural aspects of the contemporary zeitgeist," wrote Todd McCarthy reviewing the film for Variety. The tale takes on new poignancy, though, in the current climate of widespread job losses and near record-high unemployment levels. And that is exactly why Reitman changed the ending for the film version, incorporating a series of vignettes with non-actors into Clooney's tornado-like band of firings. Each of these clips shows a person reacting to their real-life job loss. "They would come in. They'd sit down at the table. We'd interview them, each one for about 10 minutes. 'How did you lose your job?' 'What was it like?' 'Who did you tell first?' How has it impacted your life?'" Reitman said, explaining the process. "And each one would turn into an impromptu scene whether they would either get angry, sad, funny and they would just start asking about things ... they went with it in a way that I would never have imagined they would because none of them had acting experience." The decision to use non-actors came from a desire to make something that honestly captured the current economic mood. "These non-actors came in and said things I would have never come up with, and they said it in a way I would have never known how to direct them to do, so it was exciting." Reitman says the experimental approach was risky, and he was even surprised the vignettes made the final cut. "I expected somebody to switch the ending ... I think the combination of 'Juno's' success and George Clooney's involvement made it that people, for whatever reason, they would just kept on moving forward and one questioned it. "I thought this was just the best way to do the scenes, and I was right." Now leading the pack of Golden Globe contenders with six nominations for "Up in the Air," Reitman must feel good he trusted his instincts.